Provident Equinox – a home to exquisitely architected residential units located at Off Kanakapura Road town, Bangalore. Designed and developed by esteemed real estate brand of Provident Group, this residential venture offers 172 units of well-designed apartments spread over a colossal land area. The project includes 2, 3 and 4 BHK commodious residential units, styled excellently to make optimal use of available area to create space for titanic living. The entire arena is carefully planned by top Architects and Engineers. 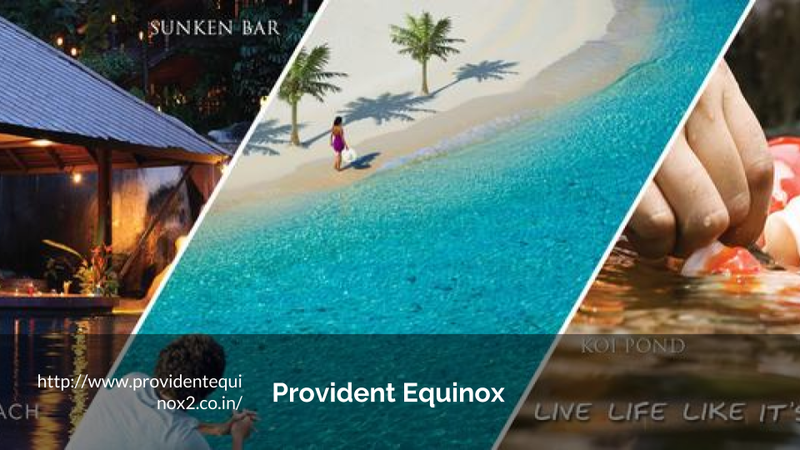 The premise of Provident Equinox is uniquely styled and is devised with an environment friendly theme. The availability of large green blankets throughout the premises sets a lively and hearty surrounds to dwell in. The campus maintains a perfect balance of open space to construction area ratio thereby providing good ventilation to residential blocks. The apartments are vaastu compliant with excellent interiors and exteriors.